The Mooni River is a northern tributary of the Barwon River. It crosses the NSW border about 50 kilometres upstream of its confluence with the Barwon. The majority of the catchment lies within the Darling Downs region of southern Queensland. The Mooni catchment is in far north NSW along the NSW-Queensland border. 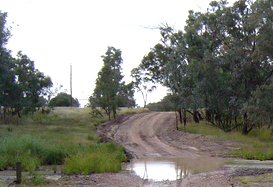 The Mooni River enters the Barwon River between Mungundi and Collarenebri. The Mooni River has a total catchment area of 14,370 square kilometres. Less than three per cent of the catchment lies within NSW (420 square kilometres). The Mooni River begins near the small village of Mooni in southern Queensland and flows south-west, crossing the NSW border about 50 kilometres upstream of its confluence with the Barwon River. The Mooni River is unregulated with only one weir along its length. View real-time data from the Mooni catchment on this website. Land use in the catchment is mainly grazing and dryland cropping. Water is used for irrigation, stock and domestic supply. The Mooni River is an unregulated stream and river flows are highly variable. Sharing the catchment's water resources fairly between NSW and Queensland, within extraction limits, set by the Murray-Darling Basin Cap is a key water management issue. An intergovernmental agreement and water sharing plans are being developed to set long-term rules on how water can be accessed, used and traded in both states.